Today we left from Dublin. Peter picked us up at the hotel at about 7 am. He also brought us breakfast which was super nice of him. We then went through customs. It was longer because we did all the American ones there, so in the airport at home we could just leave. Most of the flight I slept, literally haha. Anyway after that we got into our car and drove home from Chicago. We stopped on the way home at Cheesecake Factory which was amazing! Once we got home we talked to my dad for a bit, then I left for my softball game. Our team lost by one It was a good game, but I couldn’t play so it wasn’t as much fun. Today was our last day in Dublin and in Europe. I had a REALLY fun time. Anyway, today we didn’t do as much, but we still did a lot. We first had breakfast then we went to the National Leprechaun Museum. I enjoyed that so much. Haha, it was really funny and really cool. We went into an oversized room so it felt like we were tiny, then we went in other rooms and heard old folk stories. We also heard facts. There was a guy on our tour who was so funny. He looked like a leprechaun, a really tall leprechaun. After enjoying that, we went to Bray. Bray is a city on the coast, and they were having an airshow on the beach. So we went. The train was super crowded!!!!!! Once we were off the sweaty train, we went to watch the show for a bit, and then we got back on the train so we could get to our tour in the city. The tour we took was called Viking Splash. It was kinda cool. It was on this bus/ boat thing called Ducw (duck) that’s what he called it. We had these Viking helmet things and you could wear them if u wanted. I didn’t. Haha anywho we would yell at certain times on the road. It was really funny. At the beginning the tour guide asked where we were from and I said Wisconsin. And then he skipped over the guy sitting next to me. He said “Well, I guess I’m from Wisconsin now. Haha” I just laughed. So we went on the tour on land, then we went into the Grand Canal. It was really cool. One interesting thing was when we passed St. Patrick’s and the guide told us that although St. Patrick was the patron saint of Ireland, he wasn’t actually a saint, he wasn’t really named Patrick, and he wasn’t from Ireland. We then went to eat. We went to an Irish pub. It was really good. We had to leave before 9 pm. though because in Ireland, kids under 18 can’t be in pubs, even the restaurant part, after 9. We were done in time though. We then got on the bus and skyped my dad for a bit. We then went up to our hotel room and relaxed. We have to leave kinda early tomorrow so we can get to the airport. I can’t wait to get home, but then again I don’t wanna leave!! Today we went to the Irish country side with my mom’s friend Peter and his family. It was really fun. Their kids were very energetic and kept us going most of the day. We started off with a Full Irish Breakfast. Once we were done, we went outside and met Peter. He took us out to NewGrange and Knowth. When we got there we waited a bit for Peter’s family. When they got there we went to get on the bus to take us out to Knowth. It was about 5 minutes so it wasn’t bad. When we got there we went on the tour. It was interesting. It was the mounds the ancient people built. When we were done, we went to the top of one. When we got up there Peter’s son, Daniel, was hitting stones together like they would do back then. It was really cute. Haha anyway after that we went to Newgrange. That was a big burial mound. On the way there we saw some cows that got out, and they were all on the road. Like tons of them. After that, when we got there, it was cool when we went in because it was one of the oldest roof structures. The tour guide also told us about how on the summer solstice the light will shine just right, and will go into the mound and give them light for very little time. It was really cool actually. When we got back,we went to lunch. It was good. I got a hamburger. It tasted more like meatloaf though. It wasn’t bad. After sitting/ eating for about 1 1/2 hours, we left and went to Trim Castle. Trim Castle was really cool. It also is the oldest castle in Ireland. So before the tour started we got ice cream. We all got ice cream except for Peter’s wife, Susannah. Peter, my mom, my brother, and I all got 99 ice cream. It is soft served ice cream with a chocolate stick. It was really good. None of us knew why it was called 99 ice cream though. Then Thady and Daniel (his sons) got gummy bear ice cream. It was ice cream with gummy bears in the stick thing. (It was like a push up pop). Anywho before we went on the tour. We noticed that there was a wedding going on which was cool. I really liked the castle. It was super interesting and really pretty. I think it was a really cool tour, except for the stairs. The stairs were the swirly kind. Like really swirly. We walked in how many circles. Haha. After we went out, Peter took us to the hotel, and we thanked him. Then after relaxing for a bit, we went to Sandymount Beach. It was on the Atlantic Ocean. It was the first time we had been to the ocean so we went in, but we didn’t swim, we’re doing that tomorrow. I really liked that. Today was our first full day in Dublin. It was fun. I personally liked it a lot more because it wasn’t as crowded, which was nice. So when I woke up, my brother and mom were already up. So I got dressed and we went to eat a full Irish breakfast. The breakfast was SO GOOD. Then we went to get on our tour bus. It was a hop on – hop off tour, so we could hop off anywhere. We first got off at Trinity College. It is the oldest university in Ireland. We didn’t get the tour, we just walked around. Then we got on again. We went to Grafton Street and went shopping. We went to this place called Carroll’s it was a fun store. We got a few things. We found some super funny shirts, we were tempted to get them but we didn’t. I think that was a cool store. 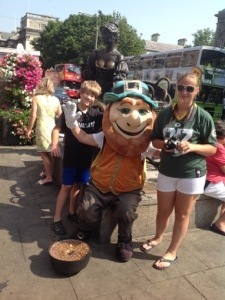 Then after looking around a bit my mom found a leprechaun… She had us take a picture with him. Haha. After that we got back on the bus. We then went to the National Museum and National Gallery. They we’re both pretty cool. It was neat because in the museum was from the beginning of Ireland time. I didn’t know Vikings settled in Ireland! Once we were done with those things, we went to the Dublin Castle and Christ Church Cathedral. We didn’t go in either of them we just walked around and looked. After that we went to St. Patrick’s Cathedral. It was gorgeous. I’m not joking. It was so pretty. We walked around and looked. When we were done with that, we got back on the bus. We then went to something my mom wanted to go to. The Guinness Storehouse. It was actually really cool to see. At the end my mom got a free pint of their beer and we got free soda 😀 we then went to Kilmainham Gaol. The Kilmainham Gaol is an old jail. It may not sound interesting, but it was. They talked about what the did and all the different rooms, so it was about an hour. It was worth it. It was really cool. I learned a lot about Irish history. We then went to get dinner. we picked up some water and we headed to the hotel. Tomorrow we are going to Newgrange with my Mom’s friend Peter. I’m Hoping it will interesting. Today we juts walked around Paris because it was our last day there for a while. When we got up, it was later than we planned, but oh well, we were up really late last night. When we first got up we went to the Louvre. We got some breakfast first. It was really good. We had just normal pastries, they taste better in France :). After we ate and had been asked a dozen times to buy mini Eiffel Towers, we went to go into the Louvre. We tried going in the secret way. It was closed. So we went to another entrance, but not the main one. We waited about 45 minutes, compared to 2-3 hours for the main entrance. Once we got in we saw the Egyptian display. I guess it was neat but I’m not a big fan of history. One thing that I did like was pieces of the insides of the Pyramids. Then we went through the medieval rooms, we didn’t really look but then again we did. After at we walked around and looked at all the paintings and sculptures. My mom wanted to see the Winged Victory, so we did. To look at it or take picture it took a hit because so many people wanted to see it. We got a picture though. 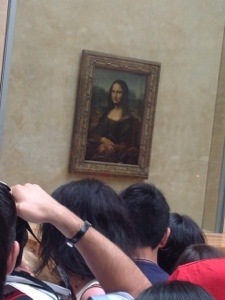 Then we went through the renaissance rooms to look for the Mona Lisa. It took a bit but we found it. It was hard to get a picture because almost everyone was trying to get to the front. When I saw it I noticed that it was much smaller than I thought. After we got a picture, we left to find Napoleon’s apartments. That’s when me and my brother got moody because we couldn’t find it and we were tired. So yeah, my mom wasn’t too happy either. Haha. After looking at them, we went outside to sit and relax. On the way out, we saw the pickpockets we were warned about. They were trying to get people to sign a petition so they could distract you and steal your things. We didn’t fall for it . After we got out of that we went to find Notre Dame. We went to the wrong one at first but it was still really pretty. It was smaller and right behind the Louvre. When we went in, I took a really cool picture of a candle, then we left. We went to find Notre Dame. We finally found it and we went by it, and I got pictures for fair. We didn’t have time to go in, plus the line was at least around the block. Once I got my pictures we left. After that we all needed some time to relax. We took a bus to Petit Palais. (Peh-teet pa-lay) We wanted to see if André was right about the having them best ice cream. So we got in free because we were going to the garden café. It was the best ice cream ever!!!! We also went on their wifi. We also just looked at it. It was super pretty. Especially the flooring and ceiling. The floor was mosaic and the ceiling was covered in murals. After relaxing we went to Napoleon’s Tomb. Part of it was a military museum. This was something my brother REALLY wanted to see. I didn’t really care. So we looked around for a bit in the WW1 and WW2 part. Then we went to the tomb. The tombs were huge and built very fancy. After looking around that for awhile, we left. Then we went back to the hotel to get our bags. Once we did we left and got on the metro to the airport. It took about an hour. We were really early, but we’d rather be sitting for a few extra hours than stuck in traffic, and miss our plane. Once we got there we checked in and went through customs. It was a lot easier than in the U.S. we then went to eat. We got McDonalds. It wasn’t the first choice but it was all they had. Today we got to Paris. When we first got to Paris we had to find where our bike tour was. We found it but it took a bit. Once we got there a tour guide told us about the tour. Then we walked to their office, where we met up with our guide. His name was Andre. He told us again about the tour and safety things. He also talked about how we were going to dominate the road. But that’s later. He then asked my brother to be his co-pilot. He said yes. So he was in the front of the group. 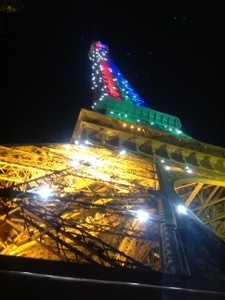 So we biked around Paris and saw some famous landmarks. The ones I can pronounce are the Louvre, Napoleon’s Tomb, and then the place we had lunch, Tuileries gardens, which was very very good. Anywho we just biked around and we stopped at certain places and talked about them. Then we started dominating the road. That’s pretty much where we didn’t let the cars stop us. We gave them a zoolander face. It was so funny. He also said if they yell words out of their window, don’t remember them. Also if they give u a finger give them your index finger and wave a no no no at them. Then we just biked around. After that we went to have lunch. On the way there, we had to dominate the round-about. It was quite funny actually cuz we were yelling for Sparta, well an attempt, and we took up a whole lane. Some of the people’s faces were funny. Also there were two men in cars that were like yelling at each other it wasn’t too pleasant. Anywho we finally got to lunch and it was DELICIOUS. Andre sat by us and it was fun to talk to him. We have some things in common, like soccer, so that’s what we talked about. After we left there we went down an old freeway that they closed. The path is where my brother wiped out. He and Andre were racing, no one was in front of them, and this little girl decided to walk right in front of my brother. When he noticed, he couldn’t stop so he hit her. Se was fine, just road rash. Same with my brother, but his was worse. Then we were off again and we dominated the road. 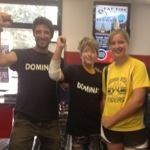 We were pretty close to their office so we took a victory lap around it and parked the bikes. We then went in and we both got t-shirts. They say dominate on them. Then we got a picture with Andre and then left. That was by far my favorite tour ever. Today was our last day in London, we are now off to Paris. Today we went to two museums, a few shops, and St. Paul’s Cathedral. We went to the British Museum, I didn’t like it very much because I don’t like museums. We went to the Victoria and Albert Museum. It was actually really cool. It was more modern and really cool. After the museums, we went shopping a bit. We went to Harrods and looked around. It was ridiculously priced. Like no joke, there were things over $100 million! It was super pretty though. After we left Harrods, we walked around to try to find some food. 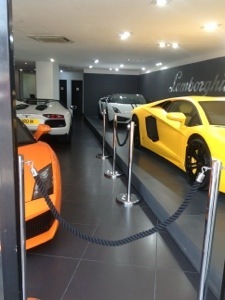 As we were walking around we saw Lamborghini London. I wanted one so bad!!!!! But they were outrageously priced. After a bit we found a little Italian restaurant. It was super good!!!!! When we were done eating we went to St Paul’s.